For wild animals, life is all about survival. And most don’t have the luxury of cheetah-fast speed or shark-like strength. But nature has equipped a select group with an unusually powerful weapon — venom. Venom can paralyze the respiratory system, destroy muscle tissue and prevent blood from clotting, among other physiological effects achieved through entering the victim’s bloodstream. On a genetic level, venom is a diverse and sophisticated cocktail of protein-based toxins that has captured the fascination of many scientists for its potential in medicinal drug development and its unique evolutionary history. Lisle Gibbs, an evolutionary biologist and professor in the Department of Evolution, Ecology and Organismal Biology (EEOB), studies one of venom’s most notorious and lethal vessels: the snake. “We know a great deal about the proteins and all the molecular machinery that make up snake venom, and it’s highly variable,” said Gibbs. Snake venom greatly differs between and within species, and largely seems to be adapted to a snake’s diet and environment. “Snakes with different venoms can eat different kinds of prey,” explained Gibbs, noting the arms race between prey resistance and venom evolution. But some variation within snake venom has yet to be explained. A wild massasauga rattlesnake in Ohio. Massasaugas dwell in northeastern regions of the U.S., typically in wetland areas, and are listed as a threatened species under the Endangered Species Act. Image courtesy of James Chiucchi. His research seeks to identify the evolutionary patterns underlying this variation, which will shed light on the intricacies of natural selection, as well as inform the development of effective antivenoms. The death toll from venomous snakebites is quite small in the U.S — with just a handful of cases each year — but globally, poisonous snakes kill between 81,000 and 138,000 people and cause about three times as many permanent disabilities annually, according to the World Health Organization. Most of these incidents occur in rural Africa, Asia and Latin America — regions with more snake populations and fewer medical resources. Last year, the WHO added venomous snakebites as a highest-priority neglected tropical disease. Gibbs is currently working with an interdisciplinary team of U.S. and Brazilian scientists to measure venom variation in wild snakes in the U.S., Central America and Brazil. One of the main questions Gibbs hopes to answer is if venom evolution is correlated with new species evolving. He also hopes to uncover whether venom evolves in a repeatable or predictable way in different species. 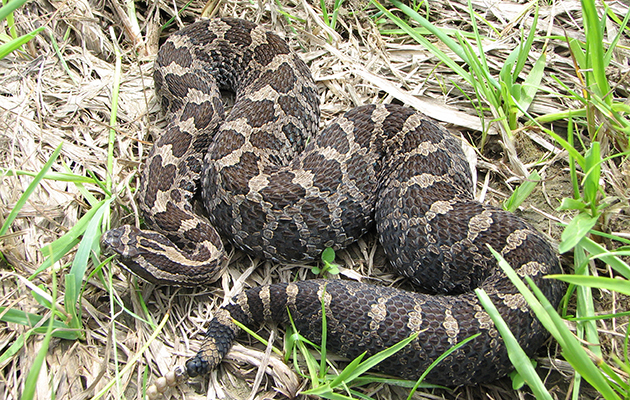 Gibbs is also working with the Ohio Division of Wildlife to look at venom in local endangered snake populations, like massasauga rattlesnakes, to assess if inbreeding is affecting their ability to reproduce. “This will help us preserve the species because we’ll see whether small populations are highly inbred and whether the lack of genetic variation will prevent them from persisting, which will dictate management activity,” Gibbs said. Meg Daly, professor at EEOB, studies venom in a slightly less intimidating animal — the sea anemone. Sea anemones are covered in specialized cells that produce venom, which they fire toward predators and prey in the form of tiny, stinging capsules called nematocysts. Nematocysts are “10 microns large, which is smaller than the width of your hair, and the tip is bathed in venom,” said Daly. For an animal with no ability to run away or grasp prey in the traditional sense, this venom-delivery method is quite useful and also is found in other cnidarian species, such as jellyfish and coral. 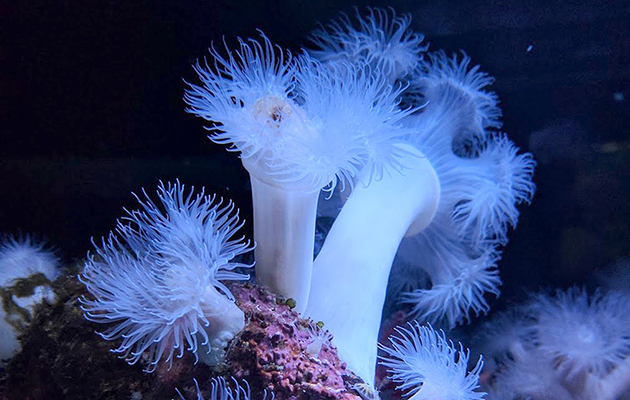 “They can’t afford to lose venom, because it’s really all they have,” Daly said, adding that sea anemone venom is harmless to humans apart from several highly toxic species. Sea anemones also use venom in a way rarely seen in the animal kingdom: against members of the same species and just to fight over territory. 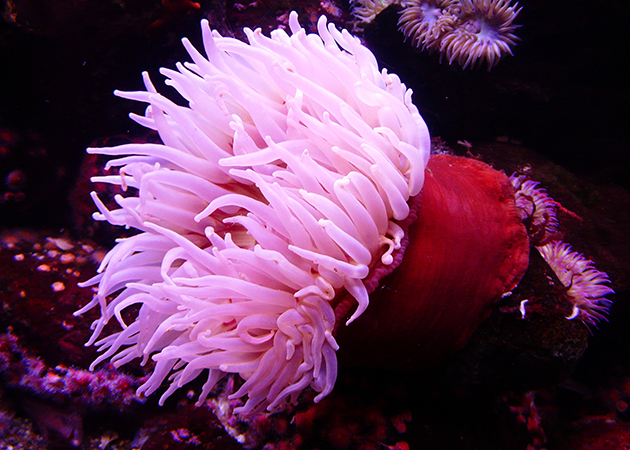 Anemones reproduce by making clones of themselves, and when two different clones come up against one another, anemones can eject pieces of their own skin attached to nematocysts that suture themselves onto the other clone. Platypuses — one of the few venomous mammals — also use venom against each other during male-on-male competition for a female mate, she added. This sea anemone is commonly known as the “fluffy sea anemone,” and all are genetically identical. When they meet up with another clone, they use venom to fight for the space that the other clone occupies. Image courtesy of Meg Daly. Daly has been documenting the diversity of venom across sea anemones and, like Gibbs, has uncovered a lot of complexity and variation between and within species. She recently helped organize the first of three interdisciplinary conferences on venom evolution and its applications to medicine. There are several successful drugs that utilize venom, such as Tirofiban, a heart drug based on a molecule found in snake venom, and Ziconotide, which is derived from cone snail venom and used to treat severe and chronic pain. With Daly, Gibbs and EEOB Professors Rachelle Adams and Andreas Chavez — who study venom in ants and short-tailed shrews, respectively — Ohio State has formed a small research community around venom.